No sooner had I posted Kath’s contribution of 2 ingredients Cookies, did she sent me this next 2 ingredients recipe of Pizza Scrolls. 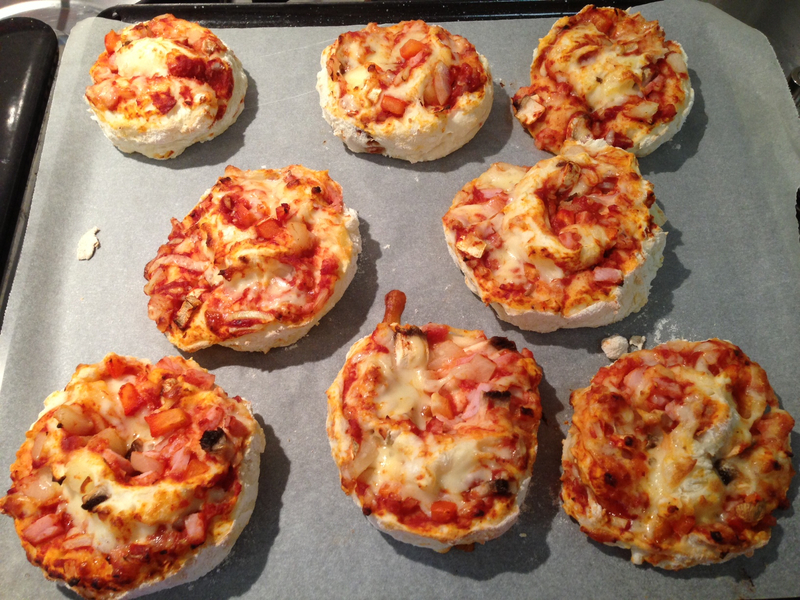 Tonight I found myself trying it out, and oh my goodness, if I put on weight this winter it will be because of these super fast, delicious and comforting pizza delights. And I suppose I should come clean – the 2 ingredients in the title refers only to the amazing bread-like, not-scone-like, base for the scrolls. But I think this is forgiveable as the fillings come from whatever veggies and bits of deli meat you have lying around in your fridge, and although they’re necessary, they’re incidental in ways that keep the food bill down. Rapidly going off in my fridge was some pre-grated cheese, 3 slices of short cut bacon, 4 mushrooms, 4 rings of tinned pineapple and half a red capsicum. So that’s what went in! 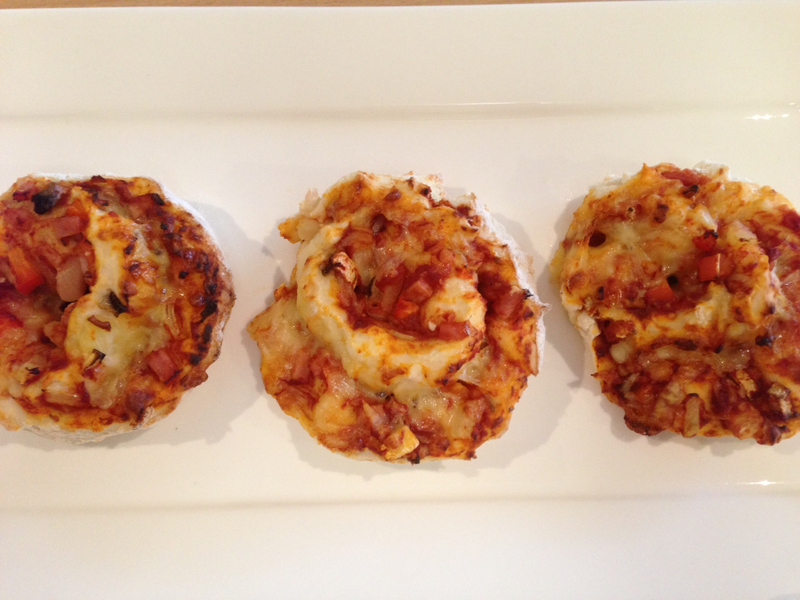 We enjoyed our scrolls for dinner (and the kids loved them), but they’d be terrific as a weekend lunch option when having friends over and, cut into quarters, would make a yummy and affordable church morning tea option. I didn’t bother costing these cause it wasn’t worth it, given how they came into being. Thanks again, Katherine! Whatever meat and/or veggies you have to use up. Make sure you chop everything finely so that they get caught up in the rolling of the scroll without falling out too much. Preheat oven to 200 degrees. Mix flour and yoghurt together. I did mine really quickly using my bench mixer, but this is not at all necessary. Knead on a well-floured bench top, adding extra flour to aid in process. Roll the dough out to about 30cm x 20cm, which should end up being around 2cm thick. Don’t stress at all about this – these scrolls are meant to be rustic looking, almost free-form. Spread tomato base, sprinkle with whatever fillings you’ve chosen, and using a rubber spatula or egg flip, start rolling at the end closest to your waist, using the spatula underneath the dough to encourage it off the bench and into the roll. Again – don’t worry how lumpy or uneven it is, just aim to get it rolling together. Cut your log in the middle using your biggest knife, cutting each section into halves until you have 16 scrolls, each about 2 cm wide. Spread out biscuit style, on lined baking trays, ingredients showing upwards, giving plenty of room for them to rise. Bake at 200 degrees for 10-12 mins. Enjoy immediately or later – whichever you need.